Seismicity in the western Himalayas is highly variable. Several historical and instrumentally recordeddevastating earthquakes originated in the western Himalayas which are part of the Alpine–Himalayanbelt. Earthquakes cause tremendous loss of life and to the built environment. The amount of loss interms of life and infrastructure has been rising continuously due to significant increase in population andinfrastructure. 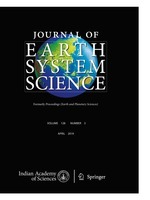 This study is an attempt to identify seismically susceptible areas in western Himalaya,using pattern recognition technique. An area between latitude 29◦–36◦N and longitude 73◦–80◦E wasconsidered for this study. Pattern recognition starts with identification, selection and extraction of featuresfrom seismotectonic data. These features are then subjected to discriminant analysis and the studyarea was classified into three categories, viz., Area A: most susceptible area, Area B: moderately susceptiblearea, and Area C: least susceptible area. Results show that almost the entire states of HimachalPradesh and Uttarakhand and a portion of Jammu & Kashmir are classified as Area A, while most ofJammu & Kashmir is classified as Area B and the Indo-Gangetic plains are classified as Area C.